"The newest and largest "sales rooms" in the world - Shoppers World - located on the Worcester Turnpike will be opened officially to the public on Thursday, Oct. 4 at 12 noon. Built on 70 acres of landscaped land, 50 acres of which are reserved for the free parking of 6,000 cars, like a palace from another world, this unique grouping of 44 independent business enterprises is the result of more than eight years of scientific planning by Suburban Centers Trust, Incorporated, Boston. This new concept of using the purchasing habits of families to inspire the building of a super shipping center, and to determine its construction and design is the story of more than a million man-hours of work by skilled laborers and the technical skills of countless consultants and architects. Designed to house 50 stores, 44 of which are now complete, Shoppers World is a U-shaped 2 level structure which opens on the 100 foot wide central green that is the length of two football fields. White paint and concrete accentuate the perfect geometrics of the "world." The base of the U is a dome, 227 feet in diameter and 54 feet high. It is the only permanent suspended domed ceiling in the world and is 4 times the size of the State House dome in Boston. The "arms" of the U have 325,000 square feet of selling space and are fronted by 15-foot covered walkways on both levels. One of the most impressive features of the world is the absence of steps within the buying areas. Ramps lead from both levels and provide effortless accessibility to the parking area which is midway between those levels. This masterpiece of modern architectural design was built as a single unit and leased to the merchants who installed fixtures and instituted decorating schemes to highlight each store's personality. The compact structure is completely surrounded by a parking zone except for several screened loading platforms. The last building of the unit now under construction and which will house 6 tenants has been planned so that it too will have a corresponding parking area. Knowing that entertainment is a part of every family's plans, Suburban Centers included a 1432 seat theatre of classic modern design in its vision of the ideal shipping fair. Acoustically perfect for both film and live programs, this cinema will be open 7 days each week. The design of Shoppers World is the combined work result of Kenneth C. Welch, Grand Rapids Mich: Ketchum, Gina & Sharp, New York City: Adams, Howard & Greeley, Boston: Anderson & Beckwith Boston, and the staff of National Suburban Centers, Inc. George B Macomber Co. is the general contractor for this project which was built at an estimated cost of $6,000.000 exclusive of interior fixtures, equipment and value of the land. The project, which was begun in April 1950, utilized more than 16 miles of electric wiring, 360.000 square feet of glass, 30,000 tons of concrete and more than 1700 tons of structural steel in its construction. Each store has installed some method of temperature control, not only for 1500 employees, but for patrons comfort. Flowering shrubs and 154 trees, as well as a permanent art exhibit, give it beauty. Four main highways -30, 9, 126, and 27, - serve the "world" bringing it within an average of 29 minutes to more than 117,000 families." 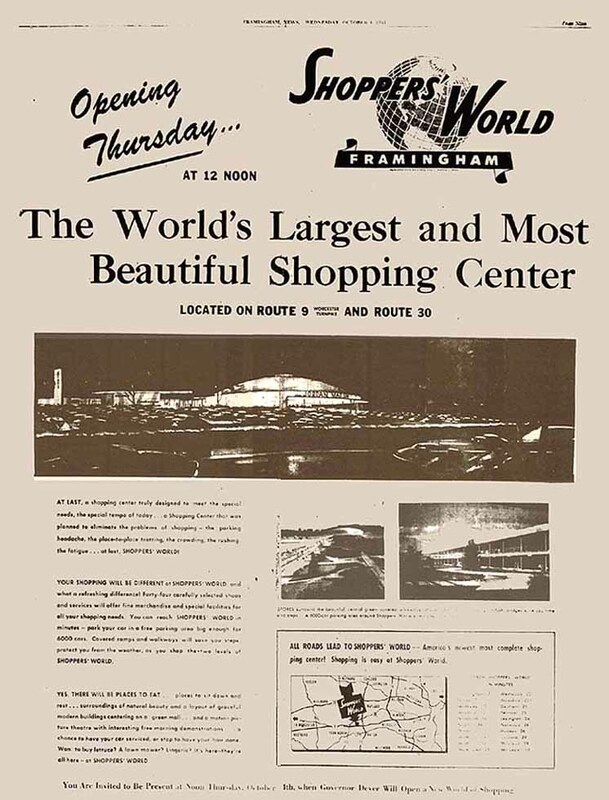 Over the years, many special attractions and promotions were held at Shopper's World. included visits by the Lone Ranger, Hopalong Cassidy, Rin Tin Tin and Rusty, circus acts, clowns, puppet shows, band concerts, actors like Crazy Guggenheim, Major Mudd, and the annual appearances by Santa and his Reindeer. There was a small area of kiddie rides at the northern end. In the 1960's a Jordan Marsh Basement Store and a Stop & Shop was built on the northern end, adding more retail space. The entire structure was demolished in December of 1994, and turned into what was called a "power center", with large warehouse type stores surrounding a parking lot. So ended the age of the Golden Mile in Framingham.